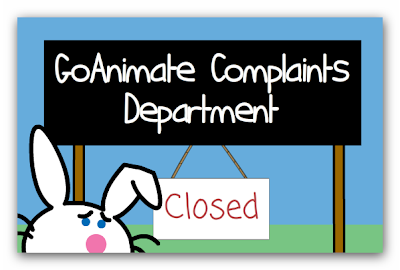 March 12, 2012 is the day Jim Benton's Happy Bunny Theme license expired on GoAnimate. Before it did I wanted to release just one more episode of this topical and much enjoyed series. This was the result, completed in just five days. (I usually spend at least a couple of weeks on these). The Complaints Dept. is one of GoAnimate's longest running series, with the first one minute episode appearing about two and a half years ago. Even though there's only 10 episodes it's continued to be popular and has been one of the most imitated series from my own catalogue. All but one uses speech balloons to tell the jokes. Including this episode there is, in fact, 11 episodes created in the two and a half years of it's existence, among them Christmas and Easter specials. The Easter special is a particular favorite as I love the scene of Happy Bunny trapped on top of his stand's sign trying to convince a bunch of kids he's not the Easter Bunny. In this latest episode it seemed only right to focus on the 'More Actions Protest Group' featuring the chick and the Dog that are also part of the Happy Bunny theme. The MAPG have been a part of the series from the beginning and appear in almost every episode. I did all their scenes first and then wove in the rest as I thought of different ideas. I had to start with Captain Kirk from the Star Trek theme, as that theme is the only licensed theme left on GoAnimate. What Kirk says about licensed themes 'making this site' is partly true. Quite a lot of GoAnimate's most respected members discovered the site through the introduction of the Star Trek theme (including RoTV - featured at the end of the video inquiring about the Water Cooler Valet position). Incidentally RoTV made it into this episode because on the GoAnimate forum he recently mentioned he'd consider any opportunity to work at GoAnimate if something came up. That idea of Happy Bunny's job opening up became the second running theme through the episode and enabled me to do a lot of self referencing to earlier episodes in the series. Only Robo Cop seems completely random but I figured the last episode, Cyborg Bunny, had featured a robot Happy Bunny so why not include another cyborg - plus I had Robo Cop already made up for another animation that ultimately didn't get made. Having the chick burn down the Complaints Desk wasn't meant to be as sad and reflective as it feels with the video finishing on the smoldering remains. I just thought it would be funny if the chick got the last laugh after two and a half years of being pretty much ignored. I actually don't see this as being the last Complaints Department I'll ever do which is why I left it with the idea that the Complaints Department was just closed for renovations. I'm sure it'll be back some day with a new look and a new character at the desk. GoAnimator, Rocque, issued a music challenge on GoAnimate's forum asking members to suggest animated music videos they would like to see other GoAnimators make. It's been one of the most popular forum topics in a while with plenty of music videos being created - purely for the fun of it, since there are no prizes. The song Animal by Neon Trees was suggested for me by GoAnimator, TheseStars. It wasn't a song I was that familiar with. In fact I'd really only heard bits of it in play outs to commercial breaks on some TV shows I watch. At first I wasn't too inspired by the lyrics but I noticed they weren't too specific and were open to interpretation so I thought I'd give it a go. Plus it seemed like an ideal song to do something a little more significant with GoAnimate's Lil' Petz theme. It was TheseStars that suggested Chaostoon's Wolfman make an appearance somewhere. Which further inspired me since I've only ever used Wolfman briefly in the third of my Harry Chalk series. This would be a chance to feature him a little more. I have to admit that through the course of making the video the song really has grown on me. Whilst I'm not a big fan of the bands original video, despite its art gallery theme and people transforming into animals, I'm very happy with how my own video turned out. Probably the only thing that seems a little unexpected is when the girl Petz starts shooting fireballs from her fingers. This came about because wolfman was kind of heading towards a creepy, stalker kind of character by looking into her window. I didn't want girl Petz to seem like a victim and I thought, why can't the she not be all she seems too - in a Buffy the vampire slayer kind of way?